If you struggle with paying attention, concentrating, or finishing tasks, you might have undiagnosed attention deficit hyperactive disorder (ADHD). 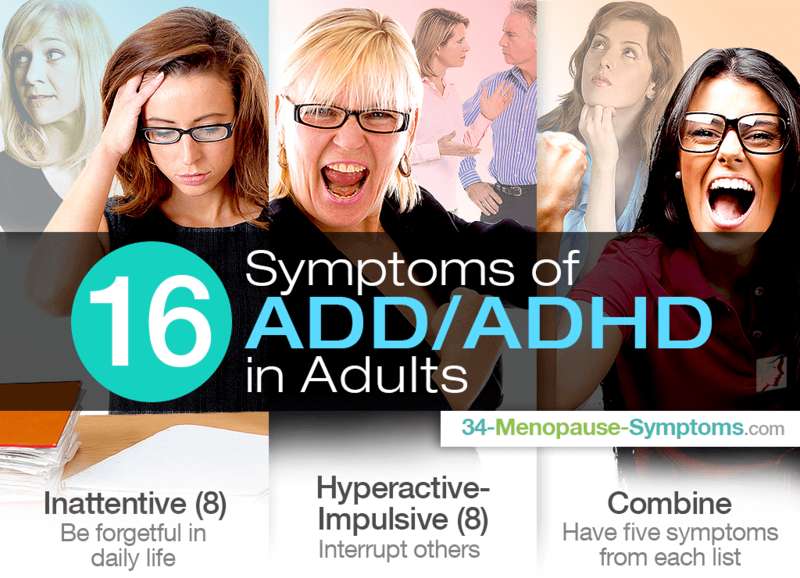 Contrary to popular belief, ADD or ADHD can affect adults as well, and up to 80% of adults with ADD/ADHD may go undiagnosed because they don't realize that it's a possible diagnosis for them or that their symptoms match the disorder. If you have been dealing with concentration problems or an abundance of restless energy, read about types of ADHD in adults and the symptoms of each to discover if your problems might fit this diagnosis. This type of ADHD focuses on people who specifically have the most trouble focusing, but don't necessarily have any of the high-energy symptoms that people tend to expect with ADHD. Because there are so few markers of typical hyperactivity, people with symptoms from this category may be less likely to receive a diagnosis, or it may take longer for the correct diagnosis to be reached. The hyperactive-impulsive type of ADHD is where the symptoms of high energy and constant movement occur. This is the typical idea of ADHD, in which somebody has trouble sitting still without some sort of movement. There is also a combined type of ADHD, in which somebody suffers from both inattentive and hyperactive-impulsive type ADHD. To be diagnosed with combined type, you will need to have five symptoms from each list of adult ADD symptoms, so 10 symptoms in total. Keep in mind that matching your experience to the symptoms on this list is not an official diagnosis, and that a qualified professional must be the one to determine whether you are experiencing ADHD. Additionally, there are other diagnoses that may explain these symptoms, so undergoing tests to rule out other conditions is crucial to receiving the correct diagnosis. Knowing these symptoms may help your decide whether you need to visit a doctor to receive a diagnosis. To learn more about improving concentration difficulties, read about the benefits of vitamins for difficulty concentrating.